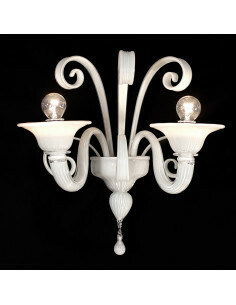 Both being unique, are elegant, refined and able to give to any type of space the character and identity where nature is the prevailing element. 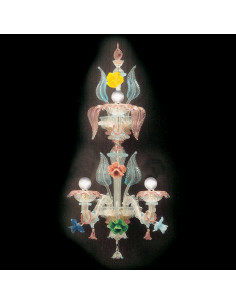 Thus, two big flowers symbolise the soul. 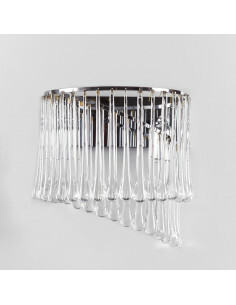 The wall light is also available in the version white/ crystal or black/ golden. An elegant and simple shape is perfect for any type of space, starting from the modern one and ending with the classic/ antique one, thanks to its colour. 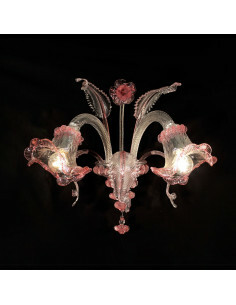 Like all other artworks of the Murano blown glass, the applique is created thanks to naturalness and refined perfection of beauty and work performed by skilled artisans. 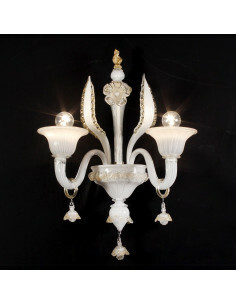 The manufacturing time of the lamp is 20/ 25 working days. 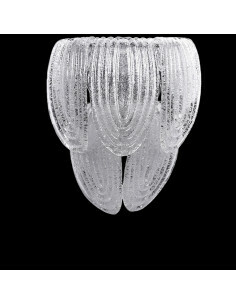 The applique with glass drops is perfect for any space, intensifying existing decorative elements, giving shineness and guarding beauty of the space. 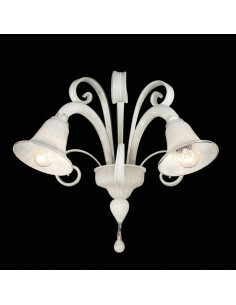 The manufacturing time of the lamp is 20/ 25 working days. 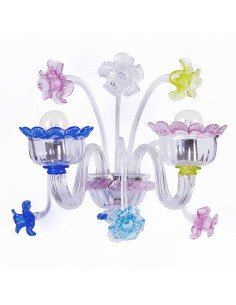 Wall lamp in Murano glass, transparent with chrome internal structure, rigadin workmanship enriched by high and low multicolor flowers. 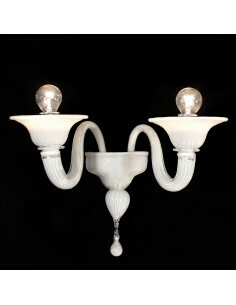 Vintage Murano glass wall lamp. 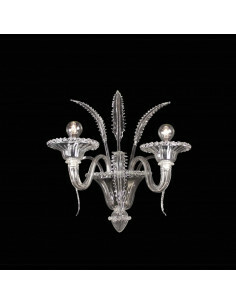 The object has a structure in chrome metal or 24k gold, where 5 hooked leaves are applied in granulated Murano glass. 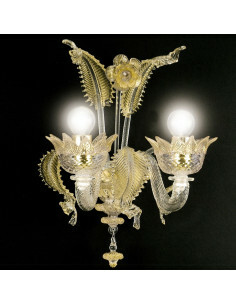 Murano glass wall lamp characterized by jagged lance shaped pastorals. 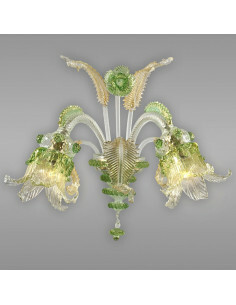 Murano Glass Applique, with pastoral shaped crystal spear and colored wires. 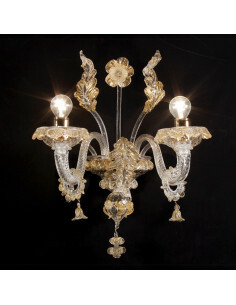 This appliqué enriched with leaves and flowers, in crystal and gold 24 k, is classic and elegant. 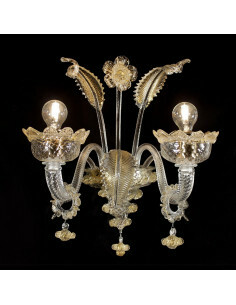 This handmade appliqué, made of crystal and gold cast in 24k, is characterized by the cup and the calla-shaped flower. This applique, with high and low pastoral arrangements, is simple and straightforward and is available in several color variants. 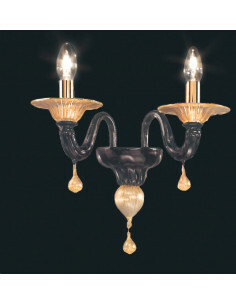 Simple and linear applique with high and low pastoral, handmade according to the techniques of the ancient art of Murano masters. Simple and linear applique, handmade according to the techniques of the ancient art of Murano masters. Available in several color variants. 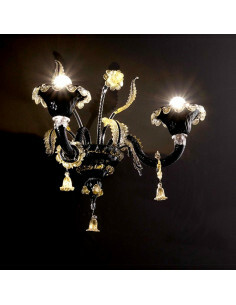 Classic applique with 24k gold details, with the possibility of being customized to your liking by choosing the color. 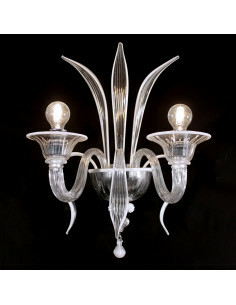 Handmade Murano Glass Applique. 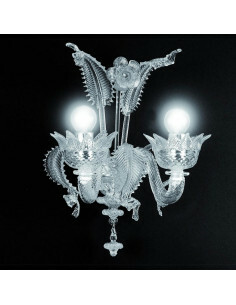 The preparation and processing time of this object is 20/25 working days. 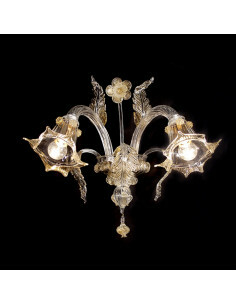 White color appliqué, with 24 k gold cast details, made of classic Murano glass and enriched by leaves, flowers and pendants. 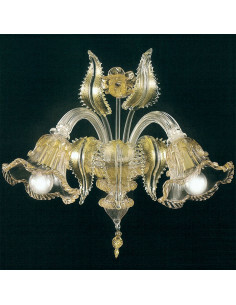 Classic Murano glass Venetian wall light created by hand, enriched by leaves, flowers and pendants.